Back in the fall, Geof and I decided to be a little more proactive in our 2013 racing schedule and signed up for a few things while we felt motivated. Fast forward to March 23, 2013, we step outside and look down in disbelief as our feet crunch down into a couple inches of fresh powder on our doorstep. "What the?!" Motivation...sprung a leak. Oh, I see, so that's the kind of day ahead of us. That's cool. It's a good thing we're ultra runners. Part of the challenge is adapting to your environment and just dealing with it. That's what makes the finish all the more sweet, right? Right. We made our way across the causeway and onto Antelope Island for the very first time race morning. Picking up our packets and numbers at the first parking lot we couldn't help but notice how insanely cold it was. Recall we are still a little bitter about how long, cold, and snowy our winter was this year and running in temps in the teens all day wasn't tops on our list at the end of March. Now when I say there was nowhere to pee for the first 15 miles, I mean it quite literally. This was a first for me. And I emerged victorious. The boulder that I ended up crouching behind, however, not so victorious. Unless it likes urine. ANYWHO. Talk about tangential thought! Looks like a coupla nice GSWs, no? 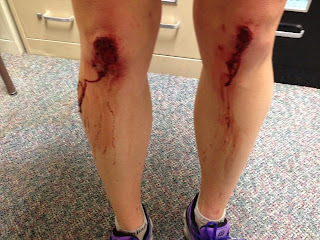 Yea, that's what I got for run-commuting to work earlier last month. Less than a mile from home. I kept on running though, looking like a total madhouse I'm sure. They really look way worse than they turned out to be. Mere surface wounds. So, yea, I was a little paranoid about falling again. It was bloody cold and windy on account of our being on an island in the middle of a lake large enough to be seen from outer space and with its own weather system. This ended up working in our favor, however, as the day wore on. We were graced with pretty much totally sunny skies and upper 20s for highs. We could see the low cloud ceiling (and snow) settled over SLC and the valley off to the east and south all day. I was super glad to be on the island this day. The west side of the island COMPLETELY ROCKS. It's a rocky, craggy, mountainous lump of land, the likes of which I was not expecting. And I loved it. Buffalo roam freely here and we saw tons of these little fellas all day long. It's slightly amazing to see these enormous beasts. Makes you feel very, very small, but in a good way. Nature rocks. We hit the Elephant Head AS (mile 5.3) in fine time and were immediately directed to run out to the point and back (you have the option of doing it first, or on your way back to the start/finish). This was yet another really cool section. Approaching this section, a pacer of a 100 mile runner proclaimed, "hey, you're the first lady!" Yea, right. I knew she had to be on something. There was no way Sarah M. wasn't ahead of me. In any event, a fire was lit under my a** and I suddenly felt a little motivated. Just before we hit Elephant Head I looked up to see Sarah approaching, smiley as can be (she always is; it's awesome). See, I was right :) So that meant I was actually in second place. Geof knew he was in for it now. We grabbed our stickers at the turnaround point (to prove we ran the Elephant Head leg) and busted out of there. The narrow single track makes passing interesting, but we managed. A buffalo was on the trail up ahead, but luckily he skittered off the trail as soon as he heard us approaching. Hitting the Elephant Head AS again (three times total here) I grabbed a Gu Roctane (my current fave gel) and we split. Both of our water bottles were freezing, and the nozzles were ice. Did I mention it was cold? My fingers were actually in pain, they were so cold. And I was a snot factory what with the wind in our faces and all. I liked being able to see other runners with the various out-and-backs on this course. It was very motivating. We weaved and bobbed along the undulating trail taking us all the way over to the shore on the west side. It was like being transported to another time and place. It was so pretty. Finally there were some boulders strewn about, and we sized each one up as possible bathrooms. I picked a good one and was none too happy to finally get to pee. I instantly felt 10 pounds lighter. Whew! Now, back to the running! I don't need to win things (though it is fun), and I certainly have nothing to prove, so I was just super content to hold onto my 2nd place spot as long as I could, just to see. Geof wasn't feeling the greatest, but he was a really good sport and pushed through it in order to help me meet my goal. We ran everything those first 19.5 miles. A lot of it was stuff I would normally walk at least some of in a race. 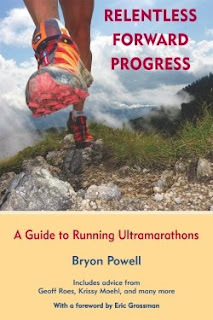 Those first 19.5 miles also have just about all of the elevation gain of the entire race, 3,800 feet. I didn't realize this at the time, but now I'm glad we ran all of that. I kept wondering if our GOTF was going to catch up to us. And then suddenly we were back at the start/finish, grabbing dry clothes from our drop bag, fresh gloves, and getting sucked in by the warm tent. We reached the tent in 3 hours flat, and spent about 15 minutes here. I decided to let go of needing to hold onto 2nd place. I wasn't here to do anything fast. I was here to run 50 miles with my husband, and finish under 9 hours. That's it. Plus, I held onto second place for 19.5 miles. That's pretty good in my book, especially considering the fasties I was running amongst. Hitting the Mountain View AS at mile 23ish we began what would be a really, really long version of 20 miles. Imagine: long, flat, featureless, flat, long, flat. I knew we were running to the southern end of the island, but I didn't realize we'd be able to see it almost the entire way. That kind of thing can make a runner go crazy. I can't imagine doing that section twice (in the 100 miler). We ran this completely on the way out because there just weren't any inclines/good excuses to walk. Reaching the Lower Frary Peak AS (mi 27.4) in 4.5 hours I was ecstatic...until Geof informed me this was not the turn around, and it was not mile 33. Feeling more than a little crestfallen, we pushed on. The Ranch couldn't have arrived any slower. I felt every single minute of this entire part of the race. Every second, every tick of the clock, every breath. I felt it, processed it, ticked it off, and took the next breath, next step, next second. Rarely am I ever so keenly aware of the passage of time. It was mentally painful. We hit the turnaround at the Ranch (mi 33) in 5:45...very decent. After a bathroom break, and some more Roctane, we were headed back out. Now the wind was in our faces again and would remain so until the finish. At least the sun was out completely and the temperature felt rather lovely by now. Lower Frary Peak AS (mi 38.7) came a lot quicker than it did the first time, and we made awesome time getting back there. Time passed much quicker after Frary, and we hit Mountain View AS (mi 44) in what felt like warp speed. There's a short section through a field with no discernible trail, other than wooden stakes to follow. There were a few bison along the way, which we gave a wide berth so as to avoid seeming aggressive. So cool. And just like that we were at the final aid station, Lakeside (mi 46), and also my second favorite part of the course. It seriously feels like a fantasy land of sorts on the west side of the island. I felt as though I were floating...pure awesome. I knew we were almost done, and I knew we were going to handily break 9 hours. The trail wound through boulder fields covered in a thin layer of bright green grass. GREEN GRASS, in March!! Sun shining on my face and arms, caffeine in my system, buffalo stew waiting to get in my belly at the finish! I felt high. And it was fantastic. The runner's high is in short supply during long runs, so I was surprised to experience it at the end of a 50 mile race. We rounded the last bend and could see the finish line tent in the distance. A short stretch of blacktop before cutting back onto a gravel road, lefthand turn, one more, and then we finally got to sit. And eat. I felt elated. We did it: 8h:47m:24s. Thinking two other women had passed me on the Mountain View Trail, I was thinking I took 6th, but when Nick S. congratulated me on taking 4th place, I had to see for myself. True story! Considering I took fourth to three crazy-talented local runners I feel pretty darn good about how we ran. And 3rd in my age group to boot. This was a deceptively difficult run. With 3,800 feet of climb and mind-blowingly beautiful sights packed into the first 19+ miles, I sort of got amped on the idea that the race was going to continue in this fashion. And then there was 26 miles of flat, unremarkable terrain to be had before closing with five awesome miles. It's a good thing we'd done a lot of flat running leading up to this race. Otherwise we probably would have bit it hard. But, now we know :) And next time we'll be prepared mentally to tackle that section better. The race organization was fantastic. Great aid stations, great finisher mugs, great buffalo stew, great cookies, great finish line atmosphere, great volunteers. I wore my new Brooks Cascadia 8s the entire day...LOVE THEM. I don't know exactly what they did to this version (I don't really pay attention to that stuff :)), but whatever it is works. I've been a Cascadia gal since the 3s, and I give each one a try, hoping they get it right with each iteration. And the 8 is the one! Great tread, great cushion, great lacing system, great forefoot space. Greatness. A huge thank you to Geof for entertaining my competitive streak and letting me have my way this day :-) You are a trooper, sweets!! So, what's next? One more month of classes, finals, and Pocatello 50 mile of course :) Why not! Nice job! I had a bad trail crash last summer and it took me a couple months to feel relaxed running fast downhill again. My knees didn't look that bad though.